Ahead of the final block, British judo legend Neil ADAMS, a double Olympic silver medallist, 1981 world champion and five-time European champion was awarded his 9th Dan in the AccorHotels Arena from the IJF President Mr. Marius L. VIZER. 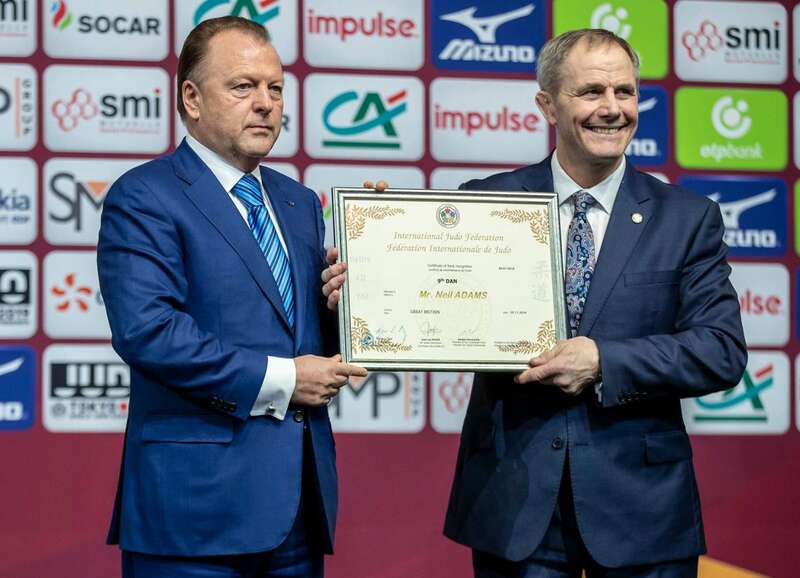 IJF Hall of Famer ADAMS, who is now the ‘Voice of Judo’ as an IJF Commentator and IJF Referee Supervisor, moved into coaching after his remarkable competitive career and had spells with the Welsh Judo Association, British Judo Association and in Belgium in coaching and technical roles. The IJF World Judo Tour now heads for Germany for the second Grand Slam of the season in less than two weeks as the best judoka in the world prepare to compete at the Düsseldorf Grand Slam from 22 to 24 February. Olympic champion ONO Shohei (JPN) will be among the superstars in action with an impressive 737 judoka and 99 countries currently inscribed.